Chawanmushi means "steamed in a small bowl." 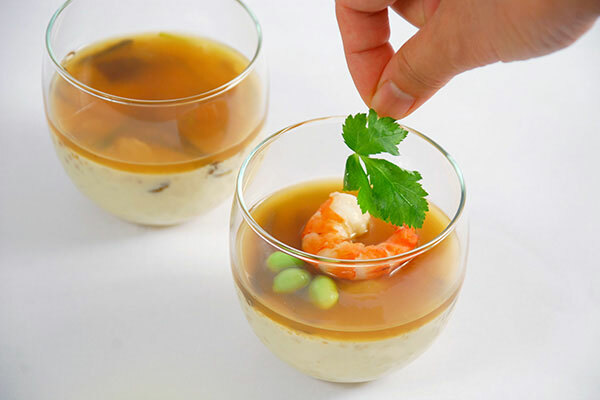 Chawanmushi is a savory Japanese custard dish that is commonly served as an appetizer or a side dish in a specialized ceramic dish with a lid to keep warm. 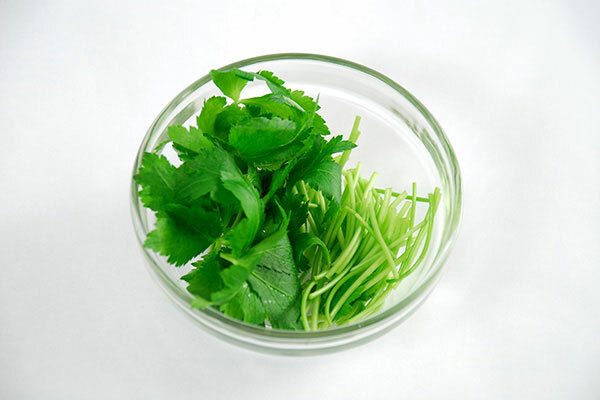 For this summer time version, "Hiyashi", or chilled in a glass is the way to go. 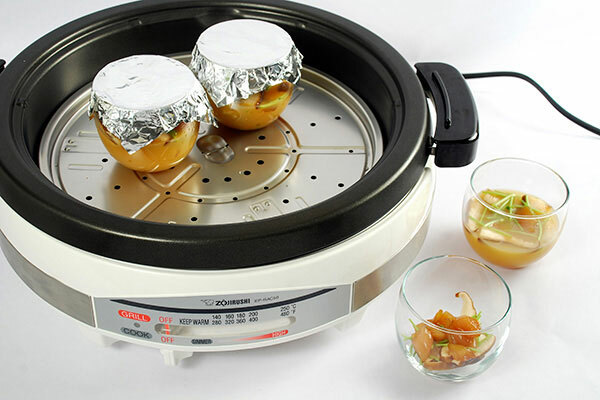 You will need 4 heat-resistant mugs that fit in the Gourmet d’Expert® Electric Skillet (EP-RAC50), about 2.5 inches tall. Make the custard. Cut mitsuba into 1 inch long segments. Reserve 4 leaves for decoration. 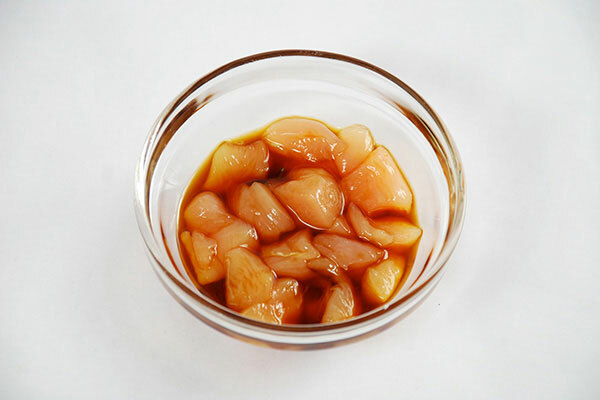 Cut the chicken tender into small cubes and marinate in sake and soy sauce for 10 minutes. Put all egg custard ingredients into a bowl, mix well but not too well (do not make it foam). 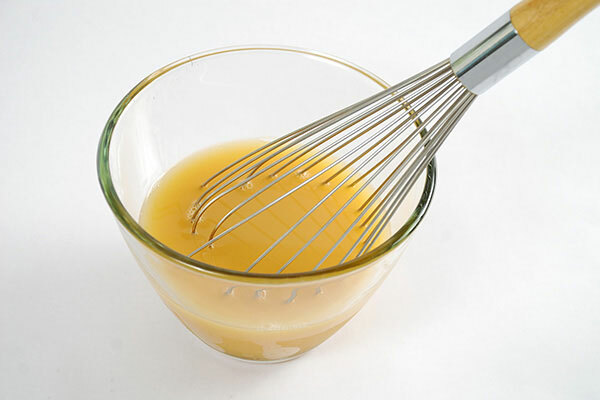 Pour the mixture through a wire strainer for a smooth texture. 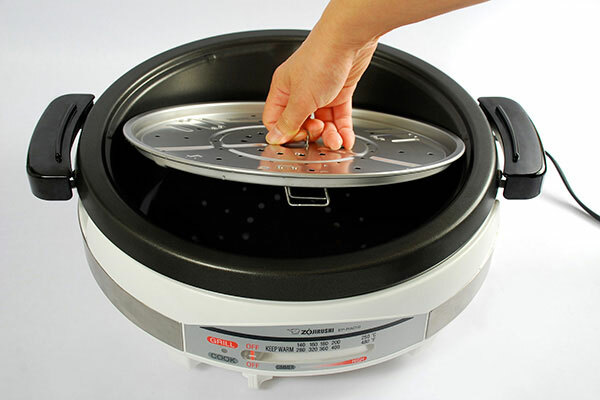 Add 3 cups of water to the deep pan of your Gourmet d'Expert® Electric Skillet (EP-RAC50), and place the steaming plate inside with its legs at the LOW position. 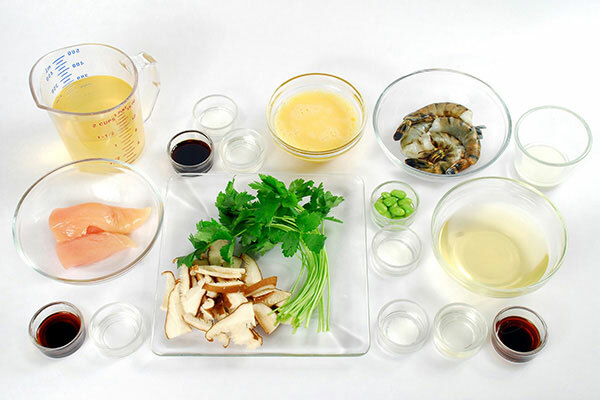 Divide the chicken, shiitake and mitsuba among four ceramic cups and pour the egg mixture. Cover each cup with aluminum foil and place on the steaming plate, then cover the lid. 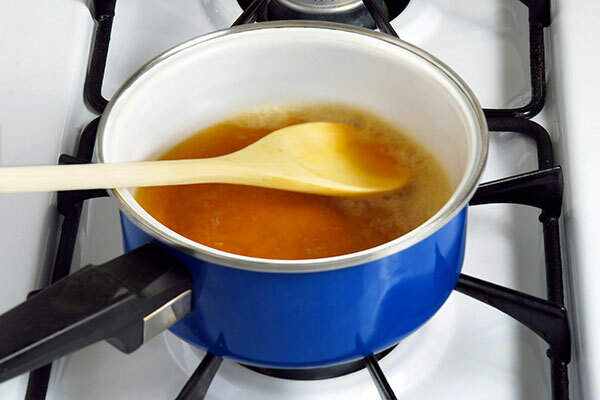 Turn the control lever to HIGH, and once it reaches a boil (or when steam begins to rise from the gap between the pan and the lid), reduce heat to SIMMER and steam for 5 minutes. Check the doneness, and if the custard is still runny, steam another 5 minutes. Repeat until the custard is firm. Insert a toothpick into the custard. If the toothpick comes out clean, it's done. Turn the control lever to off and remove the cups. Make the sauce. 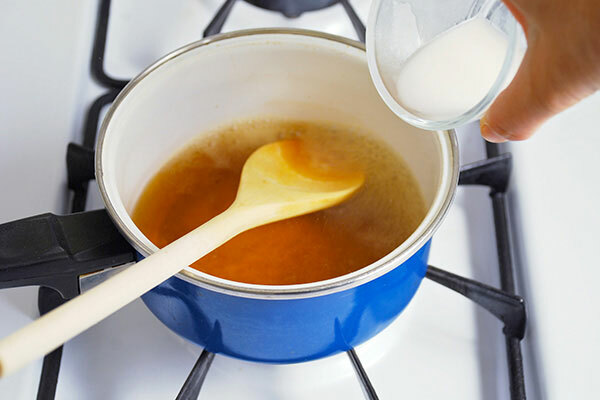 In a small saucepan, put all the sauce ingredients except the cornstarch, and bring to a boil. Add cornstarch solution to the saucepan. Stir and cook for 2 more minutes then pour the sauce over the custard 1/8 inch thick into each cup. Place cups in the refrigerator to chill for 2 hours or more. Blanch edamame and shrimp in salted water. 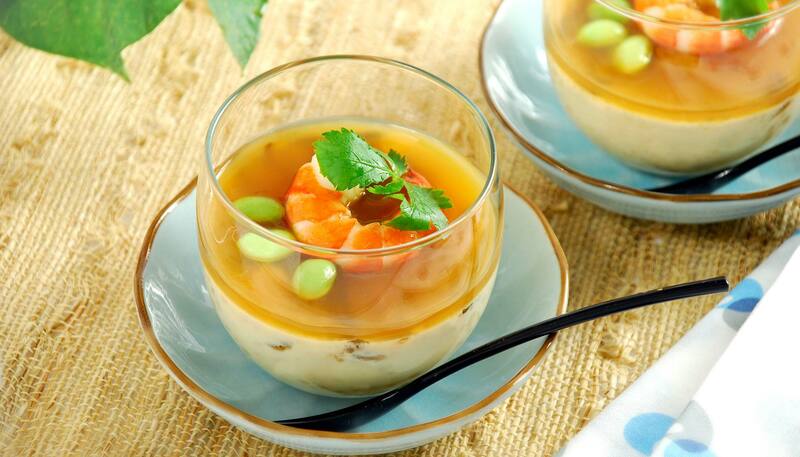 Top the chilled custard with shrimp, edamame, mitsuba leaves and serve.